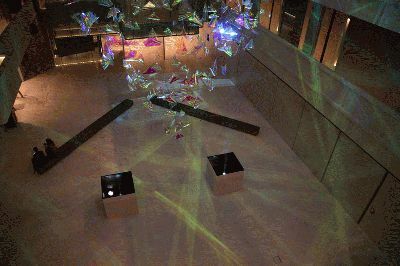 Taking inspiration from a swarm of butterflies in mid-flight, a group of students from Singapore University of Technology and Design (SUTD) developed the unique ‘Flights of Fancy’ display for the 2014 Singapore Night Festival. The installation, which was the culmination of the University’s 10-week Urban Lighting course, used the Singapore National Design Centre’s expansive space to bring a true on-of-a-kind experience to life with help from HARMAN’s Martin Professional Exterior 400 LED lighting fixtures. Throughout the University’s Urban Lighting course, students learned about the effects of both natural and artificial light on space as well as fundamental design concepts. The students then had the opportunity to develop an installation for the Singapore Night Festival as part of their final course project and according to the SUTD student team leader, Kenickie Cher Jia Jun, Martin Professional fixtures were crucial in bringing the team’s vision for ’Flights of Fancy’ to life. Created by the careful positioning of lights and shadows, ‘Flights of Fancy’ offered unique effects depending on the time of day to ensure no experience was the same—not even for two people standing beside each other. The display featured a large floating sculpture made of hanging dichroic films, a reflective material the team used to mimic butterflies ascending into the sky. To do this the SUTD student team needed a large, tall space with white walls and used eight Marin Exterior 400s, a MAC 700 Profile, and a MAC 250 Krypton to produce a powerful light for reflections. The SUTD team also programmed Martin’s MAC 700 Profile and MAC 250 Krypton moving head fixtures slowly move across the sculpture. Additionally, the lightweight of the dichroic films and the subtle movement of air throughout the space paired with the lighting effects helped animate the color reflections into a sea of shimmering lights.